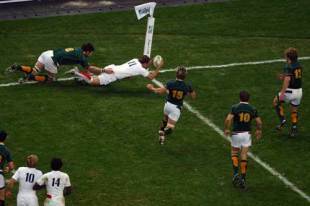 Rugby World Cup's can be won and lost in the blink of an eye with a tournament hinging on the most pivotal of moments. And the current campaign is no different. In a week that has seen Scotland crash out, an influential fly-half sidelined and Tonga overcome the French, Scrum Sevens looks at key turning points from rugby's previous global gatherings. It all looked pre-destined with the All Blacks set to contest the inaugural World Cup with their perennial rivals Australia - but nobody told talismanic winger-come-fullback Serge Blanco who had different ideas. France trailed Australia throughout most of their semi-final showdown with tries from David Campese and David Codey along with the boot of Michael Lynagh putting the Wallabies in the driving seat. But the French got themselves back in the game thanks to scores from Alain Lorieuz, Phillipe Sella and Patrice Lagisquet. Didier Camberabero drew the game level and the match looked set for extra-time with the scores locked at 24-all and the clock running down. Step forward Blanco. With one of the greatest tries the World Cup has ever seen, the French fullback broke Australia's hearts to set the seal on an epic 30-24 victory. Blanco, who enjoyed an illustrious career on the field for France, later divulged the basis of his rugby philosophy, declaring that the moment he finds the ball in his hands it is: "Instantaneous. It is spontaneous. It is spiritual. It is instinctive." The Auld enemies England and Scotland met at Murrayfield in the semi-final of the 1991 World Cup. Both sides had overcome difficult opponents in the quarter-finals with England despatching France and Scotland impressing against the dogged Western Samoans. Scotland kicked themselves into a 6-0 lead thanks to the boot of Gavin Hastings but Jonathan Webb drew England level. A relatively easy penalty about 20 metres out and in front of the posts gave Scotland the chance to wrestle back control of the game and put them on course for the final. It's one of those kicks you would stake your mortgage on the player slotting - especially when that player happens to be Gavin Hastings. However, the legendary Scottish fullback shocked the kilt-wearing masses by putting it wide of the right upright. Reflecting on the moment some years later, Hastings admitted it was "a seminal moment in World Cup history" as England's Rob Andrew went on to land a drop-goal that propelled England into the final. In his defence, Hastings maintains it is a penalty he should never have taken. "In hindsight I ought never to have taken that kick," said Hastings. "Mick Skinner had just melted me in a tackle and I was down for about two minutes getting treatment. I got up and took the kick but I ought to have given it to [fly-half] Craig Chalmers who would have popped it over and who knows what might have happened. I guess I can console myself that if I hadn't been hit in that tackle I have absolutely no doubt that the kick would have gone over." One of South Africa's key players going into the 1995 World Cup was the talismanic winger Chester Williams. However, after struggling with injury, Williams was forced out of World Cup reckoning. His return to the team came as a result of one of the most epic fights ever seen on a rugby field. South Africa dispatched Canada in their final pool game 20-0 but the result only told half the story. A scuffle between Pieter Hendricks and Winston Stanley seemed to be petering out until Canadian fullback Scott Stewart dived in on the scene. A huge brawl ensued - as can be seen through this clip - and referee Dave McHugh eventually decided to send off James Dalton, Gareth Rees and Rod Snow. Hendricks and Dalton were later banned from the rest of the tournament with Williams earning a call-up. He went onto shine in the 1995 global gathering scoring four tries against Samoa before helping inspire the Springboks to World Cup glory. Australia made light work of hosts Wales in the quarter-finals of the 1999 tournament beating them 24-9. A double from George Gregan and a further try from Ben Tune was enough to get them across the finishing line and tee up a semi-final against the reigning champions South Africa. It was the proverbial kick fest with Australia's Matt Burke and South Africa's Jannie de Beer keeping the scoreboard ticking over and eventually forcing extra-time. A penalty from Burke edged them nearer a famous win but it was a sensational drop goal that sealed victory. Fly-half Stephen Larkham had never kicked a field goal during his international career and he was reportedly struggling with a knee injury and plagued by short sightedness. But that did not prevent him from stroking the ball between the posts from 48m out. The Australians eventually went on to win the World Cup and Larkham's pivotal contribution was later marked by a famous commercial in Australia. The All Blacks entered the 2003 World Cup with the familiar tag of tournament favourites and looked good for it as they powered through the early stages of the competition. Blocking their path to the final at the semi-final stage were old foes Australia who had All Blacks fly-half Carlos Spencer to thank for their upset victory. The Wallabies had come under fire for a string of sub-standard performances en route to the final four but with just ten minutes on the clock they were given an early Christmas present. Spencer looked to spread the ball wide but did not account for Stirling Mortlock who snatched the pill and ran 80 metres to cross under the posts. Try as they might, the All Blacks failed to find a foothold in the match and Elton Flatley's boot stretched the game beyond them. Reigning champions England went into the '07 showpiece having failed to capitalise and improve on their 2003 showing. Under the guidance of Brian Ashton, England were unconvincing in their pool stage win over the USA before crashing spectacularly against the South Africans. But they recovered from that mauling to outmuscle Australia in the quarter-finals and overcome hosts France in the final four to set up a re-match with the Boks. England's improvement reportedly stemmed from a player revolt and so successful was their mutiny that they very nearly overcame Jake White's Boks side in the final. While Francois Steyn kept the scoreboard ticking over but the seminal moment came when England winger Mark Cueto crashed over the in the corner only to see his 'try' ruled out by TMO Stuart Dickinson. The matter still provokes debate to this day, but the record books show that an inch of white chalk denied England the unlikeliest of victories.